There's nothing as good as homemade tortilla chips from scratch. The best part is you can start from scratch and make homemade flour tortillas, or just begin with pre-made tortillas and fry them up. I also offer an addicting dessert chip recipe below. Mix the masa harina (available in ethnic food isles) with the salt. Add 1 cup of warm water slowly; stirring constantly. Knead the dough on a lightly floured board, adding enough of the remaining water by tablespoons until the dough becomes smooth, firm and no longer sticky. Divide the dough into 12 equal portions (makes 12 tortillas) and form these into balls. Place the balls between waxed paper and using a rolling pin, press into thin, round 5 inch diameter pancake-like shapes. They also make a tortilla press that works like magic. Cook on medium-high heat in an ungreased griddle or skillet for approximately two minutes on each side. As you cook them, stack on a large sheet of foil. Just before you are ready to eat, preheat the oven to 300 degrees and warm the stack for 5 minutes. Less fat than fried, these are wonderful with my recipe for fresh salsa. Instead of seasoned salt, you may use kosher or sea salt. 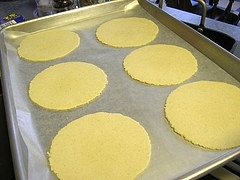 Bake until the tortillas begin to brown and then turn over and brown the other side. Grab the salsa and pico and DIG IN. 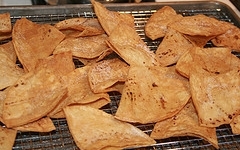 For dessert chips - When you bring flour tortillas out of the oven or pan, brush with butter and sprinkle with cinnamon and sugar. Delightful. This homemade tortilla chip recipe is from Alton Brown. In a small mixing bowl, combine the lime juice and salt. One at a time, dip the chips into the mixture and arrange on a cooling rack set inside a sheet pan. Allow to dry for 1 hour or until there are no visible signs of moisture on the chips. Place the oil into a 5-quart pot or Dutch oven and heat to 365 to 375 degrees F. Gently lower the chips, 5 to 6 at a time, into the oil and fry for 20 to 30 seconds. Using a slotted spoon or spider, remove the chips to a newspaper-lined sheet pan. Allow to cool 3 to 4 minutes before serving. *If you prefer plain tortilla chips simply stack the fresh tortillas, cut into quarters and fry according to the instructions above. If you are making chips from the Good Eats recipe in this episode, the cooking time will be 1 to 1-1/2 minutes. I have more than just a recipe for homemade tortilla chips. 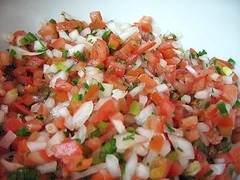 I have this authentic pico de gallo recipe. I literally live on this in the summer when tomatoes are garden-ripe.